November 2014: On Thursday, November 6th, 2014 Jersey City Fashion Week (JCFW) will donate to the Keystone Griffins, Mo Hair Foundation and the Concordia Learning Center at St. Joseph School for the Blind. The presentation of funds will be held at 4pm at City Hall with Mayor Steven Fulop in the Mayor's conference room. JFCW has just concluded the Fall 2014 Fashion Week, which housed designs by premiere designers such as Celebrity designer/rapper Jim Jones, Helen Castillo and Nathan Paul from Project Runway and Marco Hall as well as other up and coming designers. Celebrity guest this season included Fay Southerland (Rapper Joe Budden's mother) from Jersey City, John Blassingame Publisher of Hype Hair Magazine, Designer and Reality TV Star JustRaymona from Lifetime Network's 24 Hour Catwalk, Jeff Foxx from WBLS and Give to Live Board Member, Former NFL Player Darrell Reid. Pageant's winners in attendance in addition to the Jcfw host Jeannette Josue, National Ms. 2014 and Lori Bryant, Ms. Black NJ USA 2010 included Shynieka Taylor, Miss Black New Jersey 2014, Ashly Smith, Ms. Jersey City Carnival, Annette Satterwhite Cruz, Miss Exquisite Full figured USA 2014. Two African designers, Nadu Lawson and Asante Serwah, dazzled the crowd on opening night with thier colors and style. The youngest designer 8 year old Victoria Gibbs, impressed the audience during the Children's Event with her Tutus, while attendees at the VIP event were amazed at the wonderful talent of the higher end designers including Sadia Hussain and Kenya Smith. Over 300 people attended the final Emerging Designer show which had something for everyone. Project Runway designers and great emerging talent from Jersey City, New Jersey and beyond displayed their wonderful collections to an enthusiatic crowd. The designers included:Juul Jones- Juul Couture,Primitiv – Megan Teeters, Wear the Paint – Victoria Wong, Fashionsixty4 – Samantha Samuels, K Beautiful – Kesha Worodfork Berger, Chablis Designs - Tyrone Chablis, King T Designs - Latonia King! Duane Fish, Sesa - Latoiya Mitchel. JCFW ended with a well attended Fashion Brunch at Liberty Prime Steak House. During the brunch the soul speakers positive message and fashions were well received. JCFW Fall 2014 held events at Jersey City’s own Maritime Parc, Liberty Science Center, New Jersey City University and VB 3 Restaurant and Bar. JCFW is now accepting designer applcations for its 2015 Season and planning a young designers contest. Macy's is JCFW first sponsor for 2015! JCFW will donate to charities that help the homeless next season. Jersey City Fashion Week is produced by DLJ Give to Live Community Foundation a project of United Charitable Programs a registered 501 c 3 charity. Give to Lives mission to to support charitable causes through fashion, sports and entertainment. The fashion week is in its fourth showcase and third year. This year Jersey City Fashion Week will be donating to charities that are assist the sick and disabled or are in the area of health and wellness including the Mo Hair Foundation and the Concordia Learning Center at the St. Joseph's School for the Blind. DLJ Give to Live Community Foundation producers of JCFW are proud to announce a new partner in our fundraising efforts. We are now TD Bank's Affinity Membership Program members. Here is how you can help! Link your excisting or new TD bank account with the Affinity Membership Program to Give to Live using the enrollment numberAG276 and TD Bank will donate an annual percentage to the charity! That's it!! Help us continue to help others!! Open an account today! September 3, 2014– Jersey City, New York – DLJ GIVE TO LIVE recently partnered with TD Bank through its Affinity Program to support its many community services programs throughout the New York Tristate Area. TD Bank’s Affinity Program helps nonprofit organizations raise money by receiving an annual cash contribution from TD Bank, based upon accounts opened and held by the organization’s participating members. DLJ Give to Live's mission is to raise funds and awareness as well as to support charitable causes, events and needs of people in some of the following areas: sports, athletics, education, religion, poverty, homelessness, socio-economically depressed areas, law enforcement, the arts, sick and disabled people, children,young adults, students, women and the elderly through fashion, sports and entertainment events. The funds raised through the TD Bank Affinity Program will be used to further these community development and educational initiatives on an ongoing basis. For more information on the bank’s Affinity Program or to find a store near you, call 888-751-9000. TD Bank, America's Most Convenient Bank, is one of the 15 largest commercial banks in the United States with $134 billion in assets, and provides customers with a full range of financial products and services at more than 1,000 convenient locations from Maine to Florida. TD Bank, N.A., is headquartered in Cherry Hill, N.J., and Portland, Maine. TD Bank is a trade name of TD Bank, N.A. For more information, visit www.tdbank.com. TD Bank, America's Most Convenient Bank, is a member of TD Bank Financial Group of Toronto, Canada, a top 10 financial services company in North America and one of just three triple-AAA-rated banks on the New York Stock Exchange. Miguel Allure Rodriquez and cast of “Jerseylicious” Actor Marc John Jeffries from the movies Notorious BIG and Get Rich or Die Trying The Taking of Pelham 1-2-3 and HBO’s Boardwalk Empire star Justiin Davis Ms. Universe Pageant Coach Lu Celania Sierra and many more..
JERSEY CITY, N.J. – September 4, 2013—Jersey City will host its second annual fashion week with line up of movie stars, tv celebrities, super models, hi end designers, local politicians, pro athletics wives, and the like. The most exciting array of fashion-related red carpet events loaded with celebrity appearances will run from September 25th to 28th at Liberty State Park, VB3, and Liberty National Golf Center & New Jersey City University. Opening Night we will present State Senator Cunningham with a 2013 JCFW Award for her community involvement. Jersey City Fashion Week (JCFW) will celebrate emerging designers and showcase Jersey City's vibrant social scene and premiere venues, all while raising money for three worthy Jersey City nonprofits: Rising Tide Capital, Uneeek Inspiration, and The Hope Center for the Visual and Performing Arts. These groups help people in the community in special ways. Rising Tide helps people in the community start and maintains businesses while Uneeek Inspiration gives hope to children of parents who are incarcerated. The Hope Center gives children in Jersey City an opportunity to grow in the arts. Jersey City Fashion Week is presented by the Desha Lang Jackson Give to Live Foundation (Give to Live), which raises funds and promotes awareness for charitable causes through fashion, entertainment and sports-related events. Give to Live is a project of 501(c) (3) nonprofit United Charitable Programs. “We are so excited to return to Jersey City to highlight the incredible talent that exists right in our own community. We hope that people will come out to support the entrepreneurs and nonprofits that truly make our city great,” said Give to Live founder Desha Jackson. Meet the designers and models of JCFW and other VIP's, network and socialize or just come out to support the cause! JCFW opening night reception is sponsored by Hudson County Executive Thomas A DeGise and the Board of Chosen Freeholders. JCFW will kick off Wednesday, September 25 with a Networking VIP Reception at the Glamorous VB3 in Downtown Jersey City, featuring House of Sadia, a Fashion Institute of Technology graduate! Mayor Steven M. Fulop is an invited guest. JCFW will present Senator Sandra Cunningham (D) the 1st African American Senate Majority Whip and Jersey City Resident a JCFW Award for her work in the community. Linda Claude-Oben wife of former N.Y. Giant Roman Oben Super Bowl XXXVII champion and sportscaster will also be honored. The red carpet will be hosted by Stephanie Jill Chernick Ms. New York United States 2013, and Heidi Ann Uracius, Ms New Jersey United States 2013. The program Mistress of Ceremonies is commercial and fit model actress Eva Agerbrink who played Blossom in the movie Fortunes (2005). Proceeds from this event will go to The Hope Center for the Visual and Performing Arts, an arts center created to serve underserved youth in the tri-state area. The women of influence walking the runway include women from the communityy, celebrities, and women in the sports industry in light of the Super Bowl coming to New Jersey in 2014. Sharie Manon from Style Network's hit reality show Jerseylicious & Glam Fairy will host the red carpet! The co- hosts for the evening are Linda Claude - Oben, wife of former NFL player and Super bowl Champion Roman Oben, and Hilory Beckford mother of Actor/Super Model Tyson Beckford. Gracing our Runway are two special celebrities. Top model Lu Celania Sierra who is the first runway coach to have trained 3 presently crowned winners from Miss Universe, Miss USA, & Miss Teen USA. Mr. Donald Trump credits her as a key contributor to the presentation that makes the pageants successful. Justiin Davis will also walk the runway! As a much sought-after model, Film and TV Actor, Justiin Davis has appeared in print and broadcast ads for major companies such as Sprite with World Champion Olympic and 2x NBA star Lebron James; Davis made his big-screen debut in The Taking of Pelham 123, alongside Denzel Washington & John Travolta, in 2011. Justiin Davis was also cast as Lester White on HBO's Emmy winning drama, Boardwalk Empire. Designers for the evening will be Gadol who has been designing since the age of 12. He has shown capsule collections in the USA as well as South Africa Fashion Week, Nigeria, Kenya, Tanzania and Ethiopia. For several years his work has appeared in the Miss Universe and Miss World pageants. His experience as a Costume Designer has been exhibited in the Broadway productions of Dream Girls, The Wiz and Evita! Gadol brand is KONJO Collections which means "Beautiful" in Amharic. The second designer Franklin Rowe, who has worked with Mary J. Blige, Dionne Warwick, Grace Jones, Taye Diggs, is rebooting his brand after a six-year hiatus due to a near fatal car accident. Bronx, N.Y. born Rowe attended the LaGuardia high school of music and arts, whose notable graduates include Dianne Carroll, Billy Dee Williams, Kurtis Blow and Nat Adderly. Woman of Influence walking the Runway also include Jersey City Councilwomen Candice Osborne, Jennifer Watterman, Council women Watterman's daughter, Sade Benton, Assemblymen Mainor's daughter and Councilwomen Diane Coleman. The proceeds from this event will be donated Rising Tide Capital. On 9/26 there is also a featured store event. JCFW will Feature a few stores this evening including Another Man's Treasure located Downtown and Sneaker Room in the Heights. This show Features XArial and Strike a Pose Dancers and clothing from P.S. Aeroapostle, designers Rafael Perez, Terri Todd (Spark Era) and more. JCFW Community Award will be given to Marcus Johnson. Proceeds will go to Uneeek Inspiration. Actor Marc John will make an inspiring appearance at the Children’s Fashion event. Marc appeared in many children’s films, Stuart Little 2, with Michael J. Fox , Finding Nemo with Albert Brooks, Ellen DeGeneres and Willem Dafoe, Doctor Do-Little with Eddie Murphy, Spiderman2 in which Spike Lee has writing credits and Monster Inc., with John Goodman and Billy Crystal. This event is hosted by Strike a Pose Modeling Studio. This is a fashion event for children and about children. This night also includes JCFW Night of Lights which is similar to Fashion Night Out. People are encouraged to shop and dine at stores and restaurants that support JCFW for the night. Fashion in the Park is back! The emerging designer show includes designers from Jersey City and beyond. The show is hosted by Miguel Allure Rodriquez of the Style Networks hit reality show Jerseylicious!! Miguel Allure of Linden, NJ is currently on Jerseylicious which is shown every Sunday at 8pm. He has earned Mr. Gay New Jersey in 2009 and is also a spokesperson for the Beacon Light Foundation, a non-profit charity for HIV/AIDS. Miguel can be found strutting his work on the Style Network or at his home base in Linden NJ D'JNURATE CULTURE SALON! The red carpet will be hosted by Miss Black New Jersey 2010 Lori Michel Bryant! Lori is currently a pageant coach and founder of “Lure U 2 the Crown” pageant coaching. The purpose of the show is to give up and coming designers an opportunity to show and sell their clothes. Featured Emerging Designers include: Uta Brauser and Katrina Sappe from Jersey City, Custom Ready to Wear Designer Tyrell Mason who will also show his amazing collection, Plus Size Clothing Designer JustRaymona from hit fashion reality series Lifetime's 24 Hour Catwalk who has styled for Lady Gaga, Mary J. Blige, Eve, Vivian Billings and Busta Rhymes as well as many others and New Jersey's top designer Douglas Says from BET's Rip the Runway. JCFW Celebrity Spokesperson Marc John Jefferies will highlight the closing Emerging Designers Fashion Show and Week by walking the Runway and supporting the Emerging Designers. Jefferies at age 4, had his big break on the big screen in the film Losing Isaiah, in which he portrayed the young child who Halle Berry and Jessica Lange both claim as their son. Currently, Jefferies is most known for his roles in the Biggie Smalls Biography Picture Notorious B.I.G. as Lil Cease and as the young 50 Cent in Get Rich or Die trying starring 50 Cent. Jefferies was also featured in Charlie’s Angels: Full Throttle, and appeared in Brown Sugar, with Taye Diggs and Mos Def as well and Geena Davis, and TV shows like CBS’s Dexter, HBO’s TREME and many others. He was nominated for a Young Actors Award for Best Performance in a Feature Film, Supporting Actor in the Movie The Haunted Mansion (2003) and in 2002 for Best Performance in a TV Drama Series - Guest Starring Young Actor for: "The Practice" (1997). Marc has two movies in production “The Contest” and “Living with No Regrets” plus a digital series Sole Kings. These amazing show features extraordinary designers, vendors, entertainment and more. This show is sponsored by NJ Full Figured Fashion Week. Prior to the Fashion show we will feature hair, clothing, jewelry and other celebrity stylists giving people tips! On the afternoon of 9/28/2013 the weeks closing event also includes a style tips with style blazer Rayshawna Fraser at Hopssctoch. Presented by DLJ Give to Live Community Foundation a project of United Charitable Programs a 501 c 3 registered charity and backed by the City of Jersey City, Jersey City Fashion Week is sponsored and supported by PNC Bank, PSEG, Yelp, Division of Cultural Affairs City of Jersey City, The Jersey City Independent, Cores and Nachlinger, Motives Cosmetics, Mack-Cali Realty Corporation, NC Entertainment and Hudson County Executive Thomas A. DeGise and the Board of Chosen Freeholders. Style with Significance! JCFW Fashion for a Greater Good on the right side of the Hudson! A portion of the proceeds from all ticketed events will be donated to several deserving Jersey City-based charities: Rising Tide, Uneeek Inspiraton and the Hope Center for the Performing Arts. There are also free events. Please register for these as well if you plan to attend. Model Casting 6/4/2013 and 6/18/2013 6 pm Brightside Tavern 141 Bright Street, Jersey City. Stay for Karaoke Night! Children's Show Model Casting 6/1/2013 and 6/8/13 2 to 4 pm at Strike a Pose Studio 1536 JFKennedy Blvd, Jersey City. Registration information will be on the website. Please note Model Castings 6/4 and 6/18 2013 at Brightside Tavern, 141 Bright Street, Jersey City 6 pm. Please stay for Karaoke Night! Please complete the registration form http://bit.ly/12pYOXJ and please send form head shot and comp cards to models@dljsec.com or bring with you to casting. JCFW Children's Event Model Casting 7/13 and 7/20 2013 2 to 4 pm Strike a Pose Modeling Studio, 1536 JFKennedy Blvd. Jersey City. Send comp cards to models@dljsec.com. Please entitled email Children's Event. Designers please send contact info, website, pictures to designers@dljsec.com to be considered. Earlier today, Jersey City Fashion Week (JCFW) put the final stitches into this year’s work by presenting four local charities with proceeds from the citywide event. In September, JCFW hosted a slew of events including four main ticketed shows benefiting Dress for Success Hudson County, Boys and Girls Clubs of Hudson County, York Street Project, and Stages, Art House Productions’ youth theater program. The first annual fashion week succeeded in helping spotlight both local and non-local designers and Jersey City businesses and organizations. The highlight of the week was the Emerging Designer’s show at Liberty State Park, which attracted more than 200 fashion lovers, including Latin singer Natti Natasha and former NBA player and Jersey City native David Rivers. Founder Desha Lang Jackson’s Give to Live Community Foundation–which raises funds and promotes awareness for charitable causes through fashion, entertainment and sports-related events– donated $900 each to JCFW’s four charities today. The leaders of each charity were presented with the checks this morning at City Hall by Jackson and Mayor Jerramiah Healy. “This is a big day for us and we are just so excited to be sharing it with the public,” says Jackson, who is already planning next year’s festivities. For more information, visit JCFW’s website. Desha L Jackson Esq. Founder of DLJ Give To Live Foundation presented donation checks to Football Fashion Week Charities. New Jersey – City of Jersey Desha L Jackson Esq. Desha L Jackson Esq. Founder of DLJ Give To Live Foundation will present donation checks to Football Fashion Week Charities. 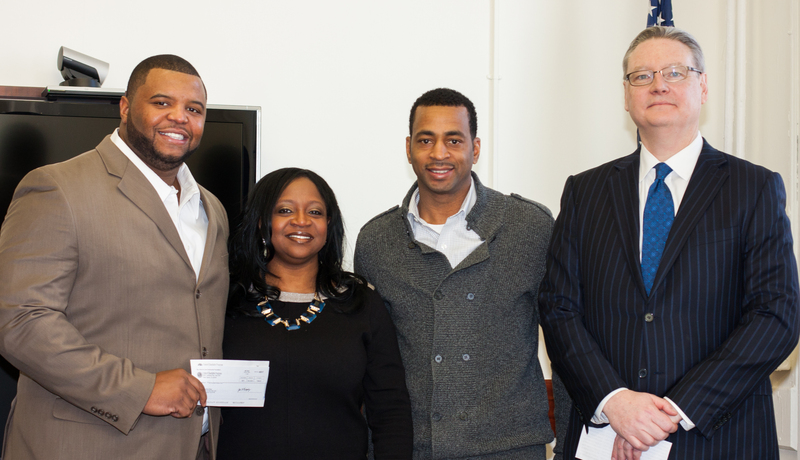 Today at City Hall DLJ Give to Live Community Foundation Program Manager and Founder of Jersey City Fashion Week Desha Jackson donated to three charities highlighted during the January 2014 Pre- Super Bowl Football Fashion Week Program. GridIron Group which provides football camps for inner city children, Jersey City Recreation Foundation and the NY/NJ SnowFlake Youth Foundation. Give to Live Foundation, producers of Jersey City Fashion Week, Atlantic City Fashion Week, and BK Style Foundation, producers of Fashion Week Brooklyn, have announced their collaboration and eager efforts to restore and rebuild the community by exposing art and fashion by emerging designers to raise money for local non-profits. 2014 Football Fashion Week is supported by City of Jersey City Mayor Fulop, City Council of Jersey City, and Division of Cultural Affairs of Jersey City! Jersey City Fashion Week (JCFW) presented by DLJ, Give to Live Community Foundation, is a registered 501(c) 3 non-profit dedicated to promoting awareness for charitable causes within Hudson County through fashion, entertainment, and sports-related events. DLJ Give to Live Community Foundation a project of United Charitable Programs a 501 c 3 registered charity. FOR IMMEDIATE RELEASE: February 8, 2014. Emerging Designers Score a Fashion Touchdown and Make a Statement; At 2014 Jersey City Fashion Week Presents “Where Fashion Touches Down” Football Fashion Week - A Pre-Super Bowl XLVIII Fashion Event! (JERSEY CITY, N.J. – November 15, 2012)—The Jersey City Fashion Week was a complete success it was the first of many more to come. The community came together to support each other and this gala of daily events during the Jersey City Fashion Week. Our supporting Mayor Jerramiah Healy helped to kick off the week on September 21 at Michael Anthony’s and enjoyed the biggest fashion event during the week, the Emerging Designer’s show on September 28 at Liberty State Park where there were over 200 plus attendees. The guest really enjoyed ‘The Emerging Designers’ runway show and there is still talk about how brilliant the children were at the children’s fashion show which took place on September 24 at the Boys and Girls Clubs of Hudson County. This event made it possible to raise money for four worthy Jersey City charities: Dress for Success Hudson County, Boys and Girls Clubs of Hudson County, York Street Project and Art House Production’s. This was an exciting event and everyone is looking forward to JCFW 2013! Jersey City Fashion Week is presented by the Desha Lang Jackson Give to Live Community Foundation (Give to Live), which raises funds and promotes awareness for charitable causes through fashion, entertainment and sports-related events. Give to Live is a project of United Charitable Programs, a 501(c ) (3) registered charity. “A big heart felt thank you to all of our sponsors, supporters, Night of Lights businesses, volunteers, our Mayor and all of the guests that purchased tickets. Everyone truly came together and worked to make this event a reality. I want to especially thank the City of Jersey City Division of Cultural Affairs who supported this event from its inception. It was this office that helped us identify local non-profits to donate to. Kudos as well to Provident Bank Foundation, the County of Hudson and Atlantic Coast Media Group our main sponsors!! Jersey City is a fantabulous place for a major fashion event. I am most grateful that it was a success and look forward to next year. Because of all the support Jersey City Fashion Week received we are able to give back in order to move the community forward to four charities that help children and women in the City.” said Give to Live Founder Desha Jackson. Jersey City Fashion Week was also supported by one and all, including several celebrities. The famous new hot Latin singer Natti Natasha attended the Emerging Designer show on September 28 to show her love for fashion and to support Jersey City. Former NBA player and Jersey City native David Rivers attended the Emerging Designer Show as well. The week-long event included several events throughout the city. Night of Lights on Saturday, September 22, where local businesses offered discounts. The Children’s Charity Fashion Show held on Monday, September 24 featured youth from the Boys and Girls Club of Hudson County and around the city. On Sunday September 23 there was a Style Tips Night where celebrity stylist offered styling tips. On Wednesday, September 26, a Women of Influence fashion show was held, featuring some of New Jersey’s leaders including Roxanne Evans, anchor from Channel 12 news. On Friday, September 28 an Emerging Designer’s Show was held in Liberty State Park. Presented by DLJ Give to Live Community Foundation and backed by the City of Jersey City, Jersey City Fashion Week is sponsored by the Provident Bank Foundation, Atlantic Coast Media Group and the County of Hudson, County Executive Thomas A. DeGise and the Board of Chosen Freeholders. Supporting sponsors include the City of Jersey City’s Division of Cultural Affairs, United Water Suez,Hudson County Chamber of Commerce, Genova Burns Giantomasi & Webster, PNC Bank, PSEG, Yelp, Sephora, Jersey City Independent, DLJ Sports and Entertainment Connection and OPI. For more information on Jersey City Fashion Week, including a listing of events and information, visit jerseycityfashionweek.com. Style with Significance! Jersey City Fashion Week! Fashion for a Greater Good on the right side of the Hudson! Fashion Week is finally coming to Jersey City. Prepare to be wowed. JCFW is getting ready to bring high fashion to the waterfront. This September, top designers, emerging designers, models, buyers and more are taking over the city for JCFW’s opening reception, press conference, industry panels and fashion shows. To see and be seen, the only place to be is JCFW. Stay tuned as we unveil designers and schedule. A portions of the proceeds will be donated to charity.